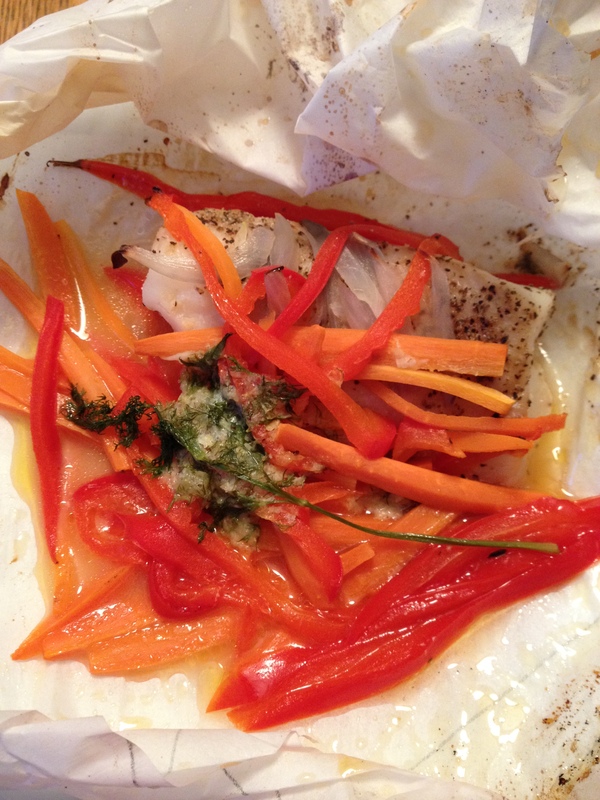 I love to experiment with parchment packets of fish, veggies and flavors. It takes less than 30 minutes from start to finish. Here is my latest based on a recipe from Cooking Light. Take 2 pieces of parchment paper measuring about 15 x 23 inches. Fold each piece in half and draw in half of a heart shape, using most of the paper. Cut shape and unfold. Place a six-ounce fish fillet on one side of each heart shape. I use cod or swai. Any fish will work. Salt and pepper fillets on both sides. 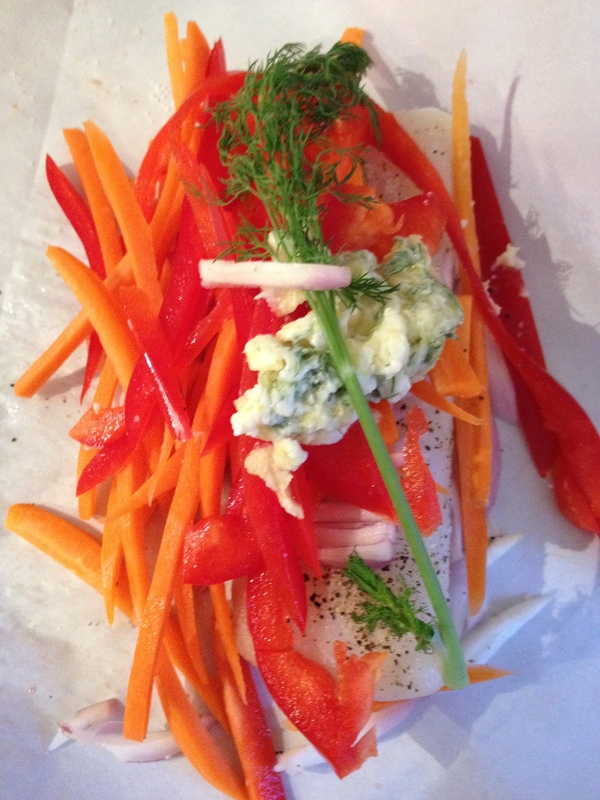 Julienne slice 1 1/2 cups vegetables such as red pepper, carrot, and another veggie like snow peas, leeks or shallots. Place half the vegetables over each fillet. In a small bowl combine: 1 1/2 tablespoons softened butter, 1 teaspoon lemon rind, 1 tablespoon lemon juice, 1 teaspoon fresh dill weed, chopped. With a small spatula, place 1/2 of the butter mix over the vegetables. Place a stem of dill over the butter if you like. 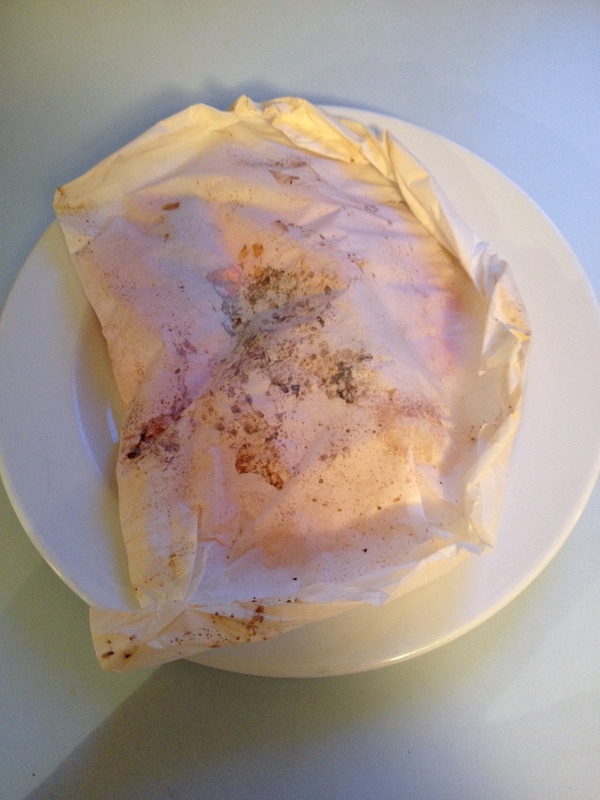 Wrap up the parchment packets as follows: Bring remaining half of paper over the fish. Double-Fold the raw edges together tightly to seal, starting at the top and working your way down. At the bottom, twist the tail to tighten the seal. Place packets on a baking sheet. For more folding instructions and photos, see the link below. Bake 15 minutes. Serve in the packets on plates. Posted in main dishes and tagged fish, julienne cut, quick dinner. Bookmark the permalink.